Shuttle's latest kicks off the 'size zero' debate again! Just how thin can computers go? And do we actually care about the girth of our desktop tech? 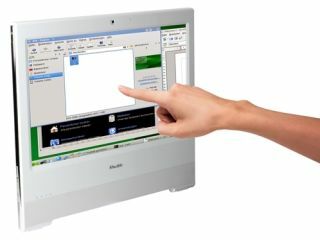 Shuttle Inc certainly seems to think we do, releasing a new ultra-thin all-in-one-PC with a Linux operating system this week. Shuttle's new X500V has openSUSE Linux 11.1 pre-configured and ready for immediate use out of the box. And it isn't a very BIG box, because the machine itself is a mere 3.6 cm thin. The company's latest Linux PC comes in either black or white, is fitted with Intel's Atom 330 dual-core processor (2x 1.6 GHz), 1 GB DDR2 memory, a 160 GB hard disk and has a 15.6-inch touchscreen (with a resolution of 1366x768), and all the other usual gubbins you find on all-in-ones – namely, a 1.3 megapixel webcam, multi card reader, microphone and speakers. Shuttle's X500V also packs in plenty of output ports and additional expansion options with rapid Gigabit network, WLAN (Draft-N), 6-channel audio, VGA output and five USB ports. And if all that wasn't enough – it even comes with a Kensington Lock to stop anyone 'alf-inching it. Shuttle's X500V retails for around £390. Interested? For more check out www.shuttle.eu/systems.